The microwave oven is a handy kitchen helper, which lets you make stuff quickly and without mess. Breakfast is also easy to prepare using the microwave, as you can just put it to cook in the oven and go about your other chores. When you are ready, out comes a tasty Atta Ka Sheera or wholesome Bread Upma , ready to enrich you! Soft and spongy rava idlis can be made in a jiffy for a quick and satiating breakfast. Sandwiches are very famous and popular snacks all over world, there are many varieties of sandwiches, here is baked sandwich with the stuffing of sweet corn. A filling breakfast, best liked by kids, youngsters and all...got this idea from italian lasagna. 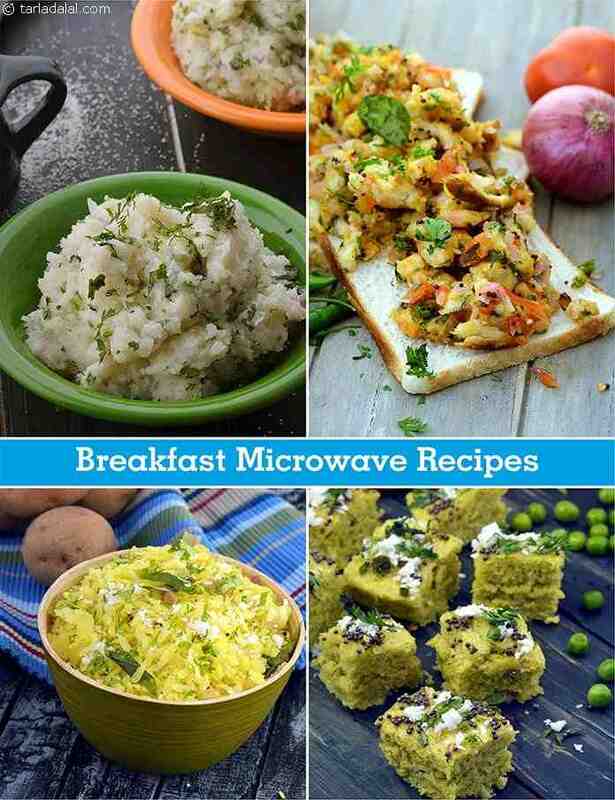 Microwave dhokla is made instant in the microwave. An excellent homemade marmalade recipe, the Tomato & orange marmalade has the perfect combination of sweet tomatoes with tangy oranges. The dash of cinnamon, cloves, ginger and sugar add to the taste, texture and flavour of this melt in the mouth marmalade recipe.